Ian Barker Butchers - The Perfect Recipe for October: Spicy Beef Hotpot with Roast Squash Wedges! 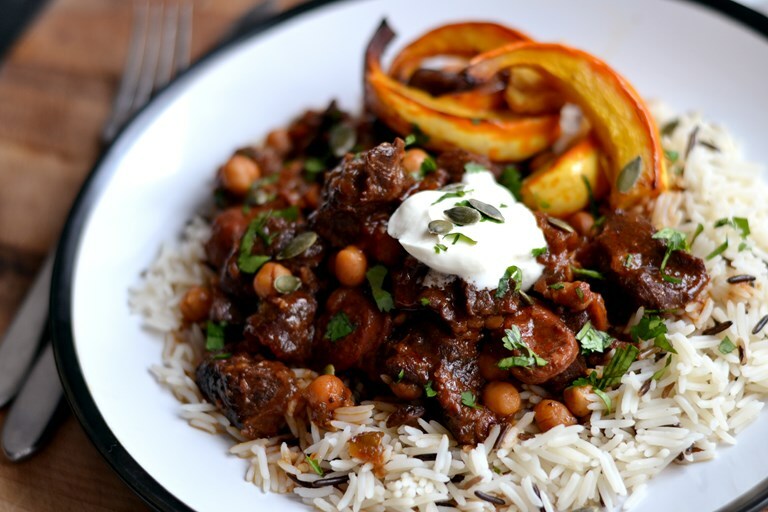 Packed with autumnal flavours and succulent beef for the ultimate October comfort food, this recipe uses simple seasonal ingredients that’re guaranteed to be loved by everyone in the family… It’s guaranteed to warm up your senses! 2. Cook slowly for about 15–20 minutes until everything is soft and sweet, then remove from the heat and scrape into a bowl. 3. Next, place the beef shin chunks in a bowl with the flour, salt and pepper and mix together, so that the meat gets a light and even coating. Return the casserole to the hob over a medium-high heat, add the remaining oil then brown the shin in batches. 11. To serve, divide the rice between plates then add a generous helping of the beef shin hotpot. Arrange some of the roast squash wedges on the side and top the meat with some sour cream, a scattering of pumpkin seeds and some chopped coriander!